Projects worked on this week have been. The Lavender Blanket. All these squares have been nearly finished with a few solid coloured squares left to complete to compare sizes. I am in the middle of making a set of jar covers like the ones I wrote for my article. I did a post with links to where you could find the article with pictures and you can read that post here. 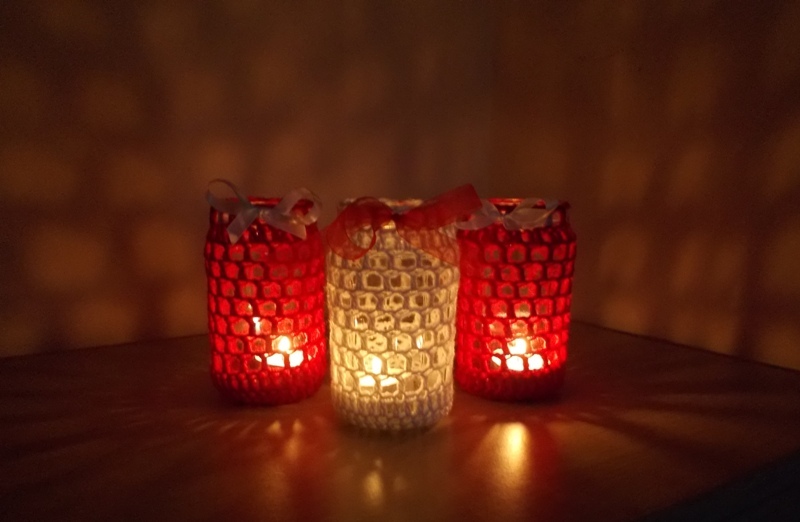 The jar covers I’m currently making are similar to these. As you can see it’s been a slow week for working on projects mainly because from Wednesday when I was back at the clinic for a check up on my ankle I’ve been in some discomfort so I’ve been reading. The cast is now off but everything else just remains the same for another three weeks. I still can’t put any weight on it until the screws get taken out in three weeks time. I’m having to put it up still as it’s still quite swollen and oh boy does it get achy. So I’ve not felt like crafting much. I have been looking at pattern writing programmes that might make it easier and quicker to write up patterns. As my computer time is limited (my leg gets sore down for prolonged periods still at the moment) the patterns are starting to build up. To read other blogs taking part in the yop year or to join in the fun, check out the Ravelry group here. My yop project notes are all up to date and can be read here. This entry was posted in Crochet, Year of projects and tagged Tea Light Covers, The Lavender Blanket. Bookmark the permalink. Thank you for that, I will try to remember. I’m sorry to say the aching can get worse as the swelling subsides. I’d keep some pain killers handy and plan to take it easy. Things’ll get done when they get done! I’ve just discovered that between last night and today as the swelling is starting to subside and I’m glad that’s what I thought as well, oh well I guess it’s foot up and rest some more. You poor thing, but reading is good too…..great first article! They look lovely all lit up. Congratulations on your first article, it’s great. I’m sorry about your ankle, but hope it continues to subside. The pattern writing program could be an answer long term anyway, as you do more and more, presumably it frees up some time to develop lines? I know three weeks seems like forever and I truly feel for you. Small progress is wonderful when you are feeling poorly and achy and all that. Good luck on the pattern program hunt. Congratulations! You’re a published author and what a great article it was. I save jars as they don’t recycle here so guess what I’m going to be doing with them? LOL! If I had time I would love to make enough for the nursing home here in town for all the patients. Your blanket squares are lovely. I really like the colors. I am so sorry about your ankle….I think that happens when they take casts off as it has gotten used to being supported and all of sudden that support is gone. It will take awhile but you will be on your feet in no time….just in case I will say some more prayers. Reading is good though! Take care. Thank you I never looked at it as me being a published author, what a kick that is! I’m glad you enjoyed it and I’d love to see all your jars. I always have plenty of them around the house so I like to find other uses for them. Congratulations on your article! And your projects this week look beautiful. I hope you get the rest you need with your ankle and it starts feeling better soon. 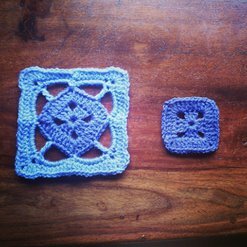 Love the crochet squares for the lavender blanket, and those jar covers are adorable. So pretty when lit up from inside!